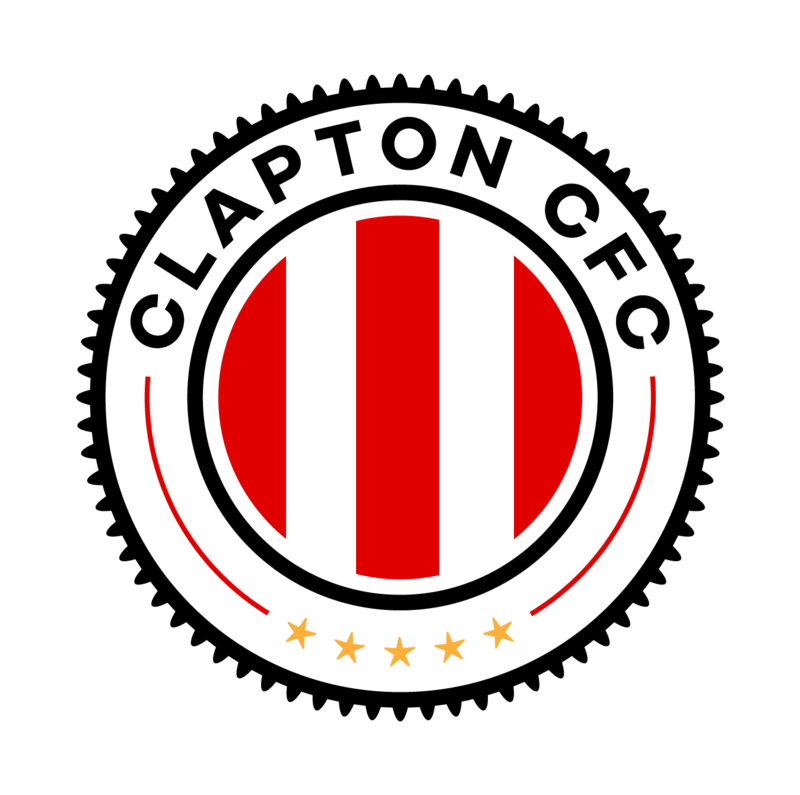 After a thrilling penalty shootout win against London Samurai Rovers in the Jim Rogers President’s Cup, Clapton CFC return to league action this weekend against Wilberforce Wanderers. 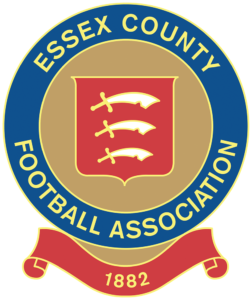 Saturday’s opponents are stalwarts of the Middlesex County Football League and the longest presence in Division One by some margin. Founded in a Trafalgar Square pub in August 2002, The Wilberforce Wanderers AFC were originally an Old Boys team for Emmanuel College, Cambridge. It still recruits young talent from there today – and is named after the Wilberforce Road Sports Ground at the college – but it has also widened its recruitment with players from around the world. After a few seasons battling in Division 2 of the MCFL, the Wanderers were rewarded with promotion to Division 1 in 2005 where they remain to this day. Back in November they made up one half of a historic clash against Stonewall FC under the world famous arch of Wembley Stadium. This week CCFC caught up with Wilberforce’s Andy Stothart to ask him how the team found this once in a lifetime experience. Stothart told us: “Wembley was an incredible experience and almost certainly the biggest highlight of the club’s history so far! “We have a long history as friendly rivals with Stonewall (Wembley was our 23rd meeting), and we were delighted to have the opportunity to be involved in the historic fixture, supporting the Rainbow Laces campaign and diversity in sport. On the night Wilberforce were defeated 3-1 by the league leaders, however they have been having a competitive season so far currently sitting sixth in the table. They are also a potential opponent of Clapton CFC in their next round of the Jim Rogers competition in March. Out of season, Wilberforce are a well travelled team, having previously toured Norway, Gemany, Czech Republic and even Malawi. Next year’s tour is still to be announced, but Andy mentioned to us that they are looking at trips to either Portugal or Norway. After a slide in form over Christmas, the Tons have been able to return to winning ways backing up their cup win with a 2-1 friendly result against Eastfield played on the astroturf at Walthamstow. Player-manager Geoff Ocran said: “The friendly was a good opportunity to rotate and also look at a few things going forward and we definitely came out with lots of positives. “Any win is a good win so we take the momentum of the two wins into the next game. Stothart mentioned that Tons fans should keep an eye out for last year’s player of the season and Wanderers no.9 Tiago Pereira. He said: “He’s on form again this season with 10 goals from 12, and will be looking to add to that on Saturday! Our temporary home, The Stray Dog, is about 20 minutes walk from Walthamstow Central station. Turn onto Hoe Street and follow the road all the way along (past the junction with The Bell pub) until Chingford Lane. Continue past Sir George Monoux 6th Form College and take the first right onto Brookscroft Road then left onto Kitchener Road. You can catch a bus along that route too. The 357, 34, 97, 215 will all take you to the top of Brookscroft Road from Walthamstow Central (approx 12 minutes). There’s also plenty of car parking space available at the ground. Postcode for your satnav is E17 4LL. Entry to the game is completely free, but we welcome donations, with a suggested £3 for waged adults. We’re on the pitch just to the left as you enter the Wadham Lodge car park. Look out for the Stray Dog sign! Fusion Foods will be there, serving delicious hot food at the entrance. They will have meat, veggie and vegan options and accept cards. There’s a pitchside bar selling cans of lager and cider. The toilets and clubhouse bar – selling a fuller range of draft beers and more – are in the main building. We’ll also have our usual programme on sale for £2. Every front cover is designed by a different artist. See the previous covers here. There is a food bank collection for this game on behalf of Walthamstow-based charity Eat or Heat. Find out what they are especially looking for here. 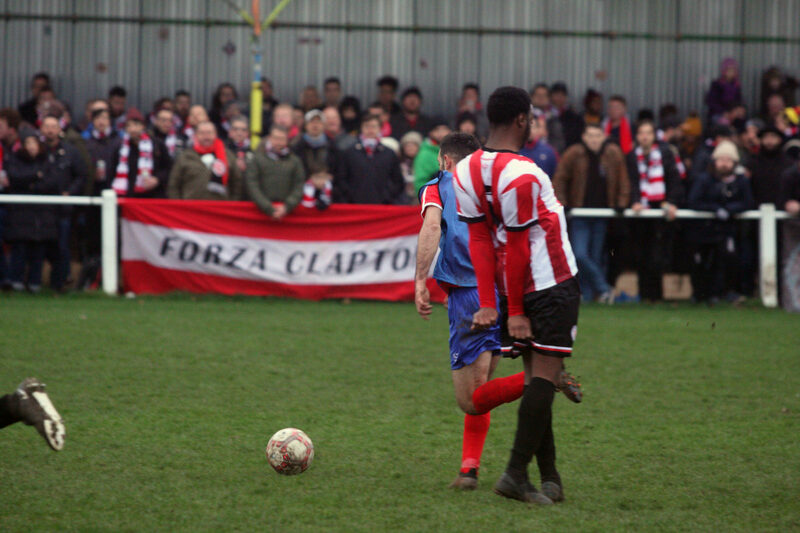 Clapton CFC vs The Wilberforce Wanderers FC is on Saturday, February 2nd at 2pm, at ‘The Stray Dog’, Wadham Lodge Sports Ground, Kitchener Road, Walthamstow, E17 4JP. You can join the Facebook event here.